Eliza Jane Johnson was the third child born to Pinkney C. Johnson and Levina C. Sherrill. Eliza Jane was born 02 Apr 1854. There were seven children in the family. The 1860 Census shows the Johnson family living in the Fancy Hill area of Iredell County. Pinkney and Levina had five children at the time: James, Freeland, Eliza Jane, Margaret and Eveline. Pinkney Johnson enlisted in the Civil War on 01 Aug 1862. He was admitted to a federal hospital on 01 Apr 1865 with a gunshot wound to the right leg that he had received at Appomattox. His right leg had to be amputated. He died in a federal hospital at Point of Rocks, VA on 03 Apr 1865 from wounds. 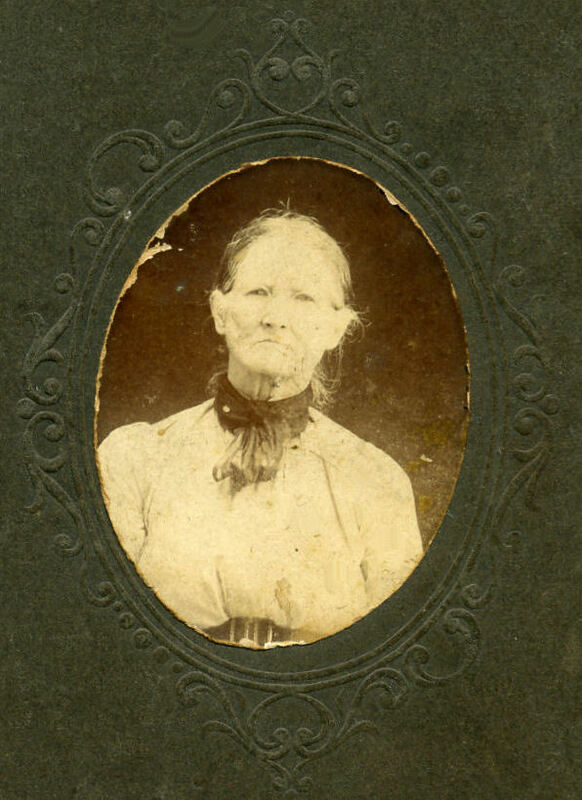 I have not been able to find any census record for Eliza Jane for 1870 or 1880. She was not living with her mother, Levina. It's possible she was living with brothers Alfred Freeland or James Harvey, but I've not been able to find census records for them for 1870 or 1880 either. Eliza Jane married James Calvin Blankenship about 1893. She was 39 and he was 27. 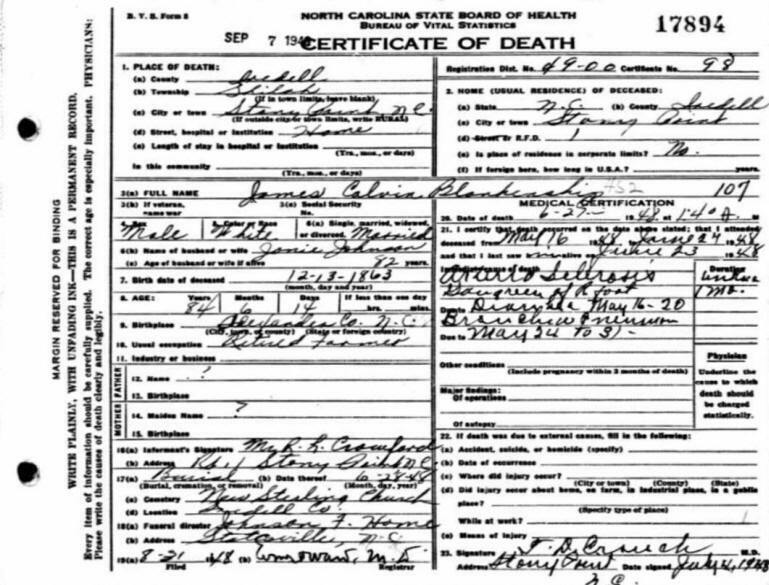 James Calvin was born 13 Dec 1863 to William Blankenship and Mary Catherine McIntosh. Eliza Jane and James Calvin never had any children of their own, but they did raise her niece Carrie Lee Edison (the daughter of Eliza Jane's deceased sister Louisa Eveline Johnson and Jim Edison), as well as Eliza Jane's grandniece, Genevia May Johnson (the granddaughter of Eliza Jane's bother John Henry Pinkney Johnson - and daughter of Beulah Vernesta Johnson Goble), and nephew Clide Kerrigan. 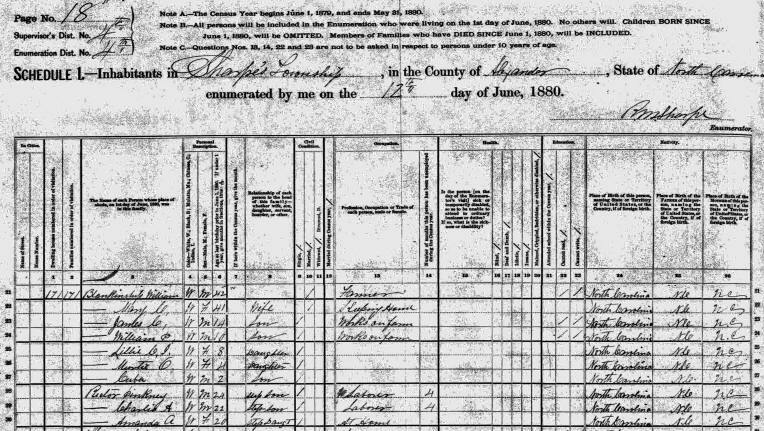 The 1870 Alexander County, NC, Census shows James Blankenship's family living in Sharps Township. His parents are William and Mary Catherin McIntosh Blankenship. There were five children living on the family farm: Pinkney F. (age 14), Amanda A. (age 10), James Calvin (age 4), Stark V.A. (age 2) and William Pool (age 7 months). ----- Mary C. 32 F W Keeping House "
------ Pinkney F. 14 M W At Home "
----- James C. 4 M W "
----- Stark V. A. 2 M W "
The 1880 Census shows the William Blankenship family was still living in the Sharps Township of Alexander County, NC. James Calvin's age was 14. He had several younger siblings: William Pool (age 10), Lillie Cleopatra Jane (age 8), Mert Ola (age 4) and Cuba (age 2). There were also three step-children living with the family in 1880: Pinkney Rector (age 24), Charlie A. Rector (age 22) and Amanda A. Rector (age 20). The 1900 Iredell County Census shows James Calvin and Eliza Jane living with her mother Levina Sherrill Johnson in Shiloh Township. It shows that James is 34 and Eliza Jane is 46. Her mother Levina was age 68. Levina's granddaughter, Carrie E. Idson (Carrie Lee Edison), age 7, was living with them, too, and was attending school. Carrie was the daughter of Jim Edison and Louisa Eveline Johnson Edison. It appears that Eveline had died by 1900 and thus Levina and Eliza Jane were raising her. By 1910, James Blankenship is shown as the head of the family. Levina's granddaughter Carrie Idson was still living with the family and was listed as James's niece - she was acutually Eliza Jane's niece (the daughter of her sister Louisa Eveline Johnson and Jim Edison). Genevia Mae Johnson was also living with the family. She was a great-niece to Eliza Jane and was Levina's great granddaughter. Mae was born 21 Feb 1903 but her father, Charlie Johnson, had left her mother, Beulah Vernesta "Nessie" Johnson, and Nessie could not raise Mae by herself. A "mulatto" nephew by the name of Clide Kerrigan was also living with the Blankenship family. The 1920 Iredell County Census shows James & Eliza Jane still living in the Shiloh Township with her mother Levina, who was now 87 years old. Genevia Mae Johnson, a niece, was till living with the family. Eliza Jane's cousin, William P. Johnson, age 64, was living with them and working on the farm. The 1930 Census shows James and Eliza Jane still living in the Shiloh Township of Iredell County. He is 68 and she is 76. There are no children living with them at this time. Eliza Jane died on 13 Aug 1930 - just four short months after this Census was taken. Eliza Jane Johnson Blankenship died on 13 Aug 1930 at the age of 76 as a result of "Carcinoma of Cervix" or cervical cancer. She was buried at New Sterling in Iredell County, NC. The 1940 Census shows James Blankenship living in Shiloh Township of Iredell County, NC. The Census says that Cary L. Crawford and her husband were living with him - as well as their children, Evie E., James W., and Mildren L. Crawford. James is 73 years old and widowed. He owns his farm and its value is $500. 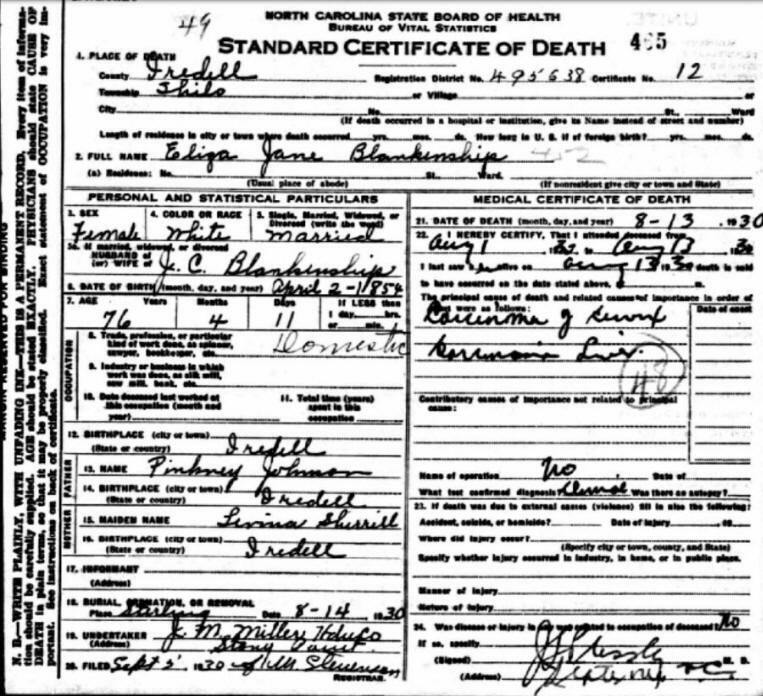 Even though the 1940 Census shows that Carrie was James Calvin Blankenship's daughter, she was actually his deceased wife's niece - the daughter of Louisa Eveline Johnson and Jim Edison. There is also some confusion over Carrie's husband's name. The 1920 Census lists him as Arthur R. (Roy) Crawford; The 1930 Census lists him as Roy L. Crawford; and the 1940 Census lists his as George R. (Roy) Crawford. Most genealogists list his name as Arthur Lee Roy (Leroy) Crawford. He was the son of William Ross Crawford and Minnie Ellen Morrow. James Calvin Blankenship died on 27 Jun 1948 at the age of 84 from "Arteriosclerosis", or hardening of the arteries of the heart. He was buried near Eliza Jane at New Sterling Church in Iredell County, NC. Carrie Edison Crawford (listed on several Census as Carrie Idson) was raised by James Calvin Blankenship & Eliza Jane Johnson Blankenship, but she was actually the daughter of Eliza Jane's sister, Louisa Eveline Johnson. 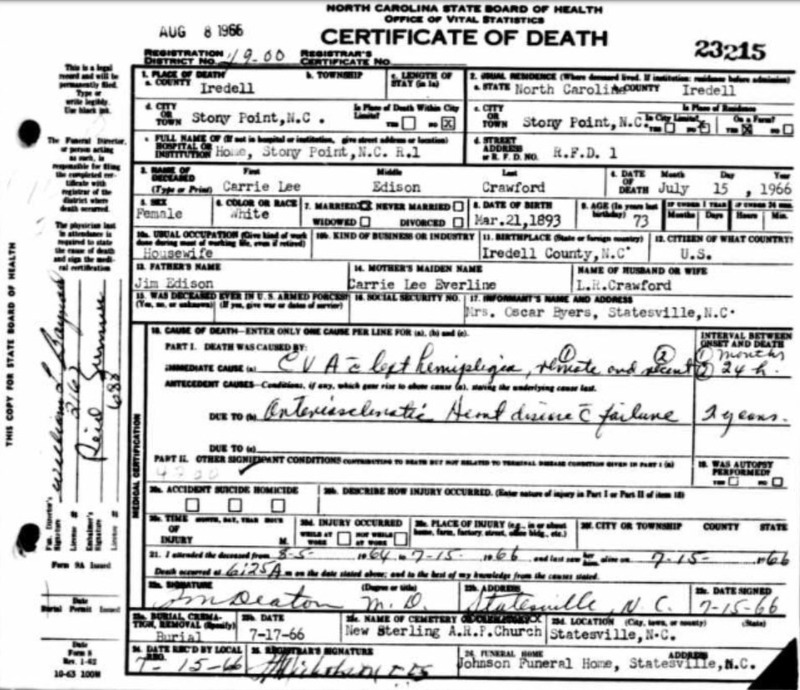 Carrie Lee's Death Certificate incorrectly lists her mother's name as "Carrie Lee Everline". If you have photos or additional information about Eliza Jane Johnson, please contact me.